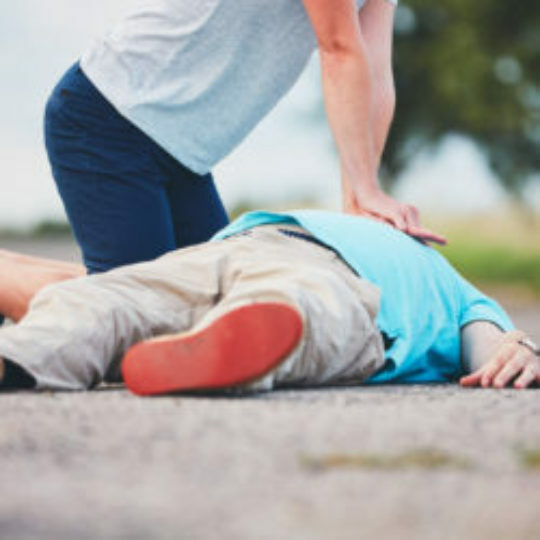 When someone suddenly collapses and goes into cardiac arrest, performing CPR (cardiopulmonary resuscitation) can double or triple their chances of survival. A new survey by the American Heart Association (AHA) reveals that most Americans are willing to help in such an emergency – but do not feel confident about performing CPR effectively. For that reason, the AHA now recommends chest compressions only for bystanders. Hands-only CPR has been found to be more effective than taking no action at all. A lot of people believe they aren’t qualified to perform CPR, or they are concerned about infection when giving breaths, but somebody’s life is at stake, and trying CPR may be their only shot. During cardiac arrest, the heart’s electrical system is malfunctioning. The heart beats ineffectively - without appropriate contractions - eventually causing loss of consciousness. Without CPR, the heart attack victim’s chances of survival diminish with each passing minute. Call 9-1-1 immediately for help. Start chest compressions. Push hard and fast in the center of the chest – 100 times per minute. Press down one-third to one-half the depth of the person’s chest (about 1-1/2 to 2 inches in adults). I think the hands-only method of CPR will make more people feel comfortable helping out in emergencies, because they’ll think, I can do this. You’ve got about 330,000 cardiac arrest victims who die outside of hospitals each year, so we’re talking about the potential for saving a lot of lives.